Adiantum thongthamii Suksathan, Amer. 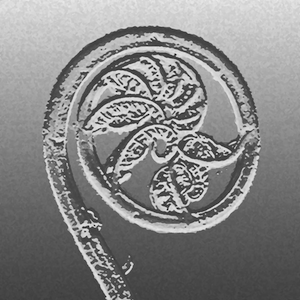 Fern J. 94(2): 77. 2004. Plants terrestrial. Rhizomes short creeping, erect to suberect, c. 5 mm diam; scales copious, narrowly lanceolate to linear, 4–5 x 0.1–0.9 mm, lustrous, concolorous, reddish brown, margins entire to sparsely minutely toothed in the upper half. Fronds monomorphic, simply pinnate, with or without a (smaller) conform terminal pinna, 7–20 cm long; stipes 3–10 cm long, lustrous, reddish brown to nearly black, sparsely to densely covered with grayish to reddish brown multicellular hairs; the hairs, spreading, 1.5–2 mm long, decreasing to c. 1 mm long toward the apex. Laminae oblong, 4–10 x 1.4–2.5 cm; rachis with indument similar to the upper part of the stipe, neither prolonged nor proliferous; pinna pairs 3–6 (–9), opposite to alternate, basal pinnae often slightly reduced in size, upper pinnae rarely gradually reduced in size. Pinnae: stalks c. 1 mm long, with short hairs, flabellate-cuneate to flabellate-truncate or suborbicular, 6–15 x 7–20 mm, green when young becoming dark bluish green with age; distally lobed to 1/3 the length of the pinna, the sinuses typically narrow, lobes rounded to truncated, entire in sterile pinnae, coriaceous, idioblast absent, both surfaces densely hairy; the hairs c. 1 mm long, adaxial hairs grey, abaxial hairs brown; veins free, forked, prominulous on lower surfaces, in dry specimens. Sori round, 8–21 per pinna; pseudoindusia small, obovate, 0.5–1 mm long, margin entire, hairy. Spores trilete, dark yellow to brown, the surfaces rugose , c. 50 mm. Occurs in full sun-xeric habitat on exposed sandstone outcrops along the Khao Laem mountain ridge between 500–640 m. Adiantum thongthamii was found growing with Melastoma spp. (Melastomataceae), Nepenthes spp. (Nepenthaceae), Doritis spp. (Orchidaceae), Adiantum capillus-veneris L. (Pteridaceae), Selaginella siamensis Hieron. (Selaginellaceae), and others. Vulnerable VUD2. This species is in a national park and is common where it occurs but is only known from a very small area of less than 20 km2. Suksathan 3608, Trat, Khao Chong (QBG). A. Habit; B. 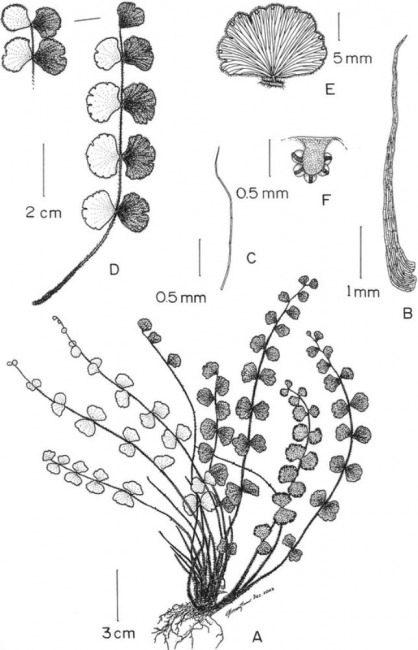 Scale; C. Hair; D. Frond; E. Pinna.